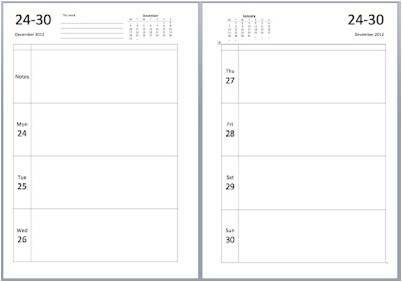 Steve and I have had some great compliments about the A5 Enhanced TimeManagement inserts that we have made available. We're both using them in our A5s and they are proving very successful. Steve wanted to build a similar insert to use alongside the diary as a journal, so he rolled up his sleeves and we're now offering this version alongside the others. 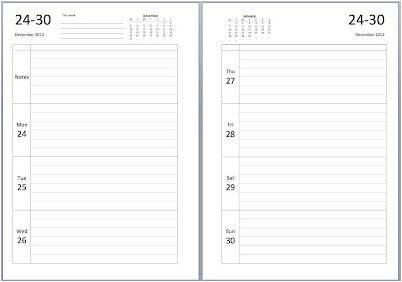 So now - like Steve - you can have a planner and a journal printed on good quality paper. LOVE these--thanks so much for offering! Question for you--I am currently a Circa user--considering switching to Filofax. I think I will like the Week Per View Journal--however you do not have 2012 template available on here. Is this something you might have somewhere I'm not seeing? I would like to give the format a "test run"!! Thanks for your help again! No there isn't. I can add it to the development list.